Genus Geo 1 review | What Hi-Fi? 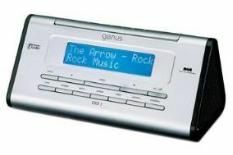 Genus is one of the lesser-known digital radio brands, and as we were getting the Geo 1 out of its packaging we were wondering why that's so. This is a stylish, individual looking radio – taking its style tips from Toblerone it seems – which is immediately endearing to use. The Geo 1 would sit neatly on a bedside table – aided in no small measure by its alarm and sleep function, plus a pleasingly big and bold display. It's mains-powered only, though – so it's more of a permanent bedroom fixture than hotel-room companion. If you like being woken up by the Today programme on Radio 4 or the less-dulcet tones of TalkSport, the Genus will suit you fine, as speech radio isn't too demanding on its rather narrow-sounding delivery. But this lightweight performance becomes more apparent with music, which deserve more bottom-end than the Geo 1 is capable of providing.